I am a big fan of winter wheat. Its yield potential can be 15 to 40 per cent higher than spring wheat depending on environmental conditions. This can make winter wheat very economical in a rotation. Growing winter wheat is fairly straightforward. However, success depends on a number of specific management practices. Planning ahead is essential. The first consideration is having fields available for seeding winter wheat at the correct time in late summer. Typically, winter wheat must be seeded in late August or early September, depending on the agro-climatic area of your farm in Western Canada. It is normally harvested earlier than spring wheat, the following year. Farmers in the brown and dark brown soil zones in the southern Prairies should seed winter wheat in the first two weeks of September. Farmers in the black and gray soil zones should seed winter wheat in the first week of September or even in the last week of August. Seeding at the ideal time is very important to allow for winter wheat to germinate, emerge, establish three leaves and then establish a crown root system before winter to ensure over-winter survival. Later seeding may result in poorly established plants, which results in lower winter survival. Later seeding can reduce winter survival and will result in delayed heading, later maturity, increased weed problems and lower yield potential. Research in southern Alberta has shown up to a 30 per cent yield decrease when seeding is delayed to early October. Frequently, soil moisture is low in stubble fields in early September. Farmers must decide whether to seed into dry soil or wait for rain. Saskatchewan research has shown that winter wheat will germinate at very low soil moisture levels. Ideally it is best to seed winter wheat at the recommended time for your area rather than wait for rain, provided that the seeding operation leaves the seed firmly covered with no more than one inch of soil. Variety selection is important. Selection should be based on a range of agronomic factors including winter hardiness, yield potential, disease resistance and lodging. Farmers outside of southern Alberta should select a variety with very good winter hardiness. Farmers in higher moisture regions and under irrigation should select varieties with good lodging and disease resistance. Check your provincial seed guide to see which varieties are best suited to your local area. Ideally, winter wheat should be direct seeded into standing stubble. Seeding into canola or mustard stubble offers crop rotation advantages such as reduced weed problems, easy-to-control volunteers and reduced disease problems. Standing stubble is very important to trap snow, which acts as an insulator. Four inches of snow will normally provide sufficient insulation to ensure over-winter survival. Winter wheat should only be seeded into “clean fields” without any actively growing volunteer cereals. In southern Alberta, volunteer grain can harbour an insect called the wheat curl mite, which can transmit a virus called wheat streak mosaic. Any actively growing green vegetation such as volunteer grain or grass in road side ditches can serve as a host for the mites. If winter wheat is seeded into stubble with green volunteer or by adjacent green fields, the mites will move from the host plants into the winter wheat after emergence and spread the virus. The damage from this disease can range from moderate to complete crop failure. The mites wrap themselves within the wheat leaves; therefore, control using insecticides is completely ineffective. Cultural controls are the only way to control this disease. 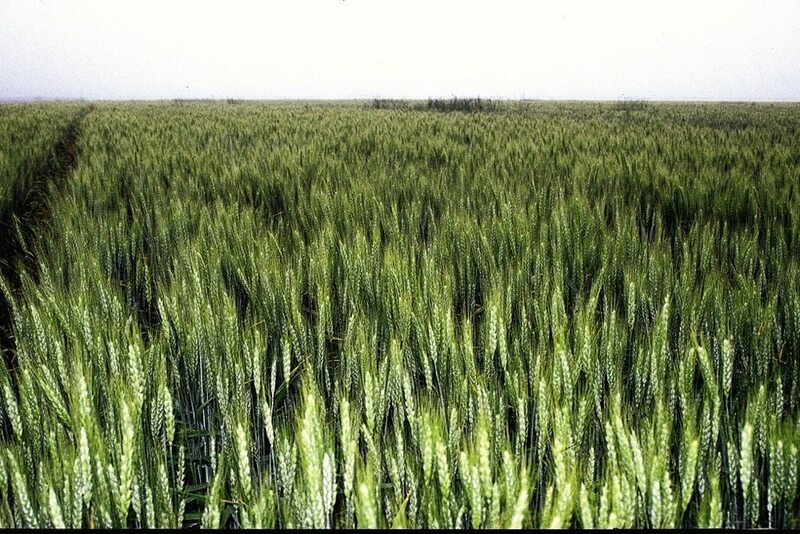 Radiant is presently the only winter wheat variety that has resistance to the wheat curl mite. Generally, winter wheat should be seeded at a rate to achieve a plant stand of 25 plants per square foot. Higher seeding rates should be used in the black soil zone and under irrigation to achieve about 30 plants per square foot. Thousand kernel seed weight should be calculated to achieve target plant population. Winter wheat has considerable ability to tiller; however, best yields are obtained with higher seeding rates. Narrower row spacing of nine inches is usually best. Winter wheat has a very short coleoptile, which is the extension of the seed embryo that pushes its way through the soil to the surface, from which the first leaf develops. To allow for this, it is very important to seed winter wheat only 0.5 to one inch deep. Winter wheat seeded deeper than one inch will often have reduced emergence. Deeper seeding will delay emergence and cause weaker, spindly plants that are more susceptible to winter kill. A common mistake new growers make is seeding winter wheat too deep! Alberta research has shown that phosphorus (P) fertilizer placed with or near the seed at the time of seeding improves plant growth in the fall and results in increased winter hardiness. Approximately 20 to 35 lb./ac. of phosphate is usually adequate and is most effective when placed with the seed. Most stubble fields are low in soil nitrogen. After a high production crop year, soil nitrogen (N) levels are often very low. Soil testing to determine N and P are strongly encouraged to accurately determine N and P fertilizer requirements. In the black and gray soil zones, potassium (K) and sulphur (S) are more commonly deficient and should also be checked. Soil sampling and testing is important to determine optimum fertilizer requirements. If soil moisture conditions are very dry at planting, it may be best to apply approximately 50 to 60 per cent of estimated nitrogen requirements at the time of seeding and apply additional N in early spring depending on soil moisture conditions. Previous recommendations for winter wheat suggested that N fertilizer should only be spring applied — fall applied N may reduce winter hardiness. Alberta Agriculture research over the 20 past years has clearly shown that fall-applied N fertilizer does not reduce over winter hardiness when applied in balance with phosphate fertilizer. Research did show that N fertilizer banded before seeding tended to dry out the seedbed, resulting in a rougher and lumpier seedbed, which negatively affected uniform germination and emergence. Research also showed that seed-placed N fertilizer applied at rates greater than 30 lb. N/ac. using urea at a seedbed utilization of 10 per cent (spreading the seed and fertilizer over 0.9 inches with a row spacing of nine inches) with low to medium soil moisture, had a detrimental effect on winter wheat germination and emergence. Therefore, side or mid-row banded N at the time of planting is usually best when N rates are higher than 30 lb. N/ac. However, seed-placed rates of up to 80 lb. N/ac. using ESN with a 10 per cent seedbed utilization can be used successfully. In spring, for most growers, very early spring broadcast urea (46-0-0) can work reasonably well. Another option is to dribble band or use spray jet nozzles to apply 28-0-0 liquid fertilizer. For both 46-0-0 and 28-0-0, there is always concern of volatilization of urea (conversion of urea to ammonia gas), therefore, apply as early as possible in the spring when soil and air temperatures are cool. Consider a urease inhibitor such as Agrotain to reduce potential volatilization. Broadcast ESN has been shown to release too slowly to be effective, and is not recommended. Due to the competitive nature of vigorously growing winter wheat in early spring, weed pressure tends to be lower than with spring seeded crops. Winter annuals are the greatest problem. However, these can be controlled with inexpensive products such as 2,4-D or MCPA. Winter wheat can be an excellent addition to a crop rotation. For more information, visit provincial ag web sites and growwinterwheat.ca.